Two Northwestern Engineering graduate students are drawing circles around the competition. Daniel Hickox-Young and Luke Prestowitz developed a novel “smart ink” pen, which propelled them to the KAUST DIY Electronics Innovation Challenge, an international contest to encourage creative and inexpensive electronics. Called the “PolySketch Pen,” the patent-pending tool culminated from a course project in MSE 337: Introduction to Conducting Polymers, developed by Jiaxing Huang. 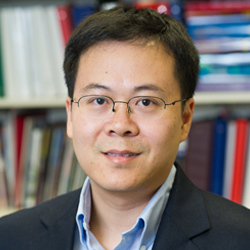 Huang, associate professor of materials science and engineering, designed the class to include self-directed experiments that challenge students to use ordinary items to create their own innovative projects. Hickox-Young and Prestowitz’s pen contains a conductive polymer ink made from dispersed polyaniline nanofibers in water. The students also worked out the right additives to help the ink dry quickly and make writing smooth on paper. Huang enjoyed writing with it so much that he used it to grade the class’s exams. Next, Hickox-Young and Prestowitz began exploring applications for their new tool. The pen’s conductive ink can be used to create chemical and mechanical sensors. They sketched a circuit with the pen and then connected it to an LED light. The light shined brighter in the presence of an acid and turned off in the presence of a base. They also used the PolySketch pen to color the fingertips in a pair of gloves, making them touchscreen compatible. “Because it’s easy and safe to use, families and teachers can teach their kids and students basic scientific principles,” Prestowitz said in a video about the project. The PolySketch pen impressed Huang so much that he encouraged Hickox-Young and Prestowitz to enter the DIY Electronics Innovation Challenge, hosted by the National Science Foundation’s Research Conference on Interactive Electronics in collaboration with the King Abdullah University of Science and Technology (KAUST) in Saudi Arabia. Not only did the judges select Hickox-Young and Prestowitz as one of just two winning projects, they awarded both students a trip to attend the three-day conference at KAUST. During the conference, Hickox-Young and Prestowitz presented their PolySketch video to conference attendees as well as elementary school students and their teachers. The presentation was met with a positive response from audience members of all ages. This is not the first innovative, DIY project to come out of Huang’s MSE 337 class. Students in previous years thought up many new ideas, including a skin health indicator, polyaniline touch gloves, and a bad breath detector. Two years ago, an MSE 337 student team made chemical sensors out of flexible toy pencils and paper. Cheng Wei Lin (MS ’13) and Zhibo Zhao’s (BS ’13) project received national press coverage and was published in the journal Scientific Reports in January 2014. All are featured on Huang’s YouTube channel, called NanoEducation. In fact, that is exactly what has happened. Inspired by Huang’s students’ polyanilene touch gloves, Nedal Y. Abu-Thabit, professor at Jubail Industrial College in Saudi Arabia, challenged his undergraduate students to design a similar project. The results were reported in a recent paper published in the Journal of Chemical Education. Huang’s approach to the class is two-fold: impart knowledge and inspire creativity.